The Yamaha DX7 was a remarkable instrument for its day, its day being some time in 1983. Unlike other keyboard synthesizers of that period, it generated sounds not by plugging oscillators and filters together, but by actual algorithmic digital synthesis, or “FM synthesis.” The result was the ability to create an almost inexhaustible palette of real and imaginary instruments, rich, textured music and enough special effects to frighten an entire alien invasion. The DX7 was not without its downsides. It required a lot of head banging, long words and complicated math to fully master; it was expensive, huge and heavy; its keyboard was plastic and a bit nasty and its bronze-age digital to analog converters were fairly noisy and gave everything it played a vaguely electronic edge. Still, it totally rocked back then. One of the coolest aspects of the DX7 was its capability of having its voices edited through its user interface to create new sounds – albeit only after its users got its somewhat mind-numbing FM synthesis technology by the throat. 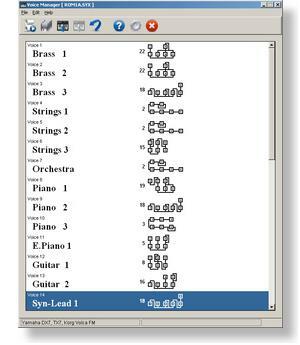 Having created new voices, said voices could be downloaded over its MIDI interface, stored on what passed for computers back then, shared and subsequently re-uploaded. Thousands of 32-voice banks were authored for the DX7 and its early progeny, and most of them survive to this day. In more recent epochs, the acoustic shortcomings of the DX7 came to spell its doom, at least for us. Its somewhat brittle sound and its propensity for creating audible background noise when it was played saw it supplanted by newer instruments which, if less versatile, ultimately sounded better. As of this writing, we gave away our last DX7 over a decade ago. We kind of miss the beast… but no, not really. 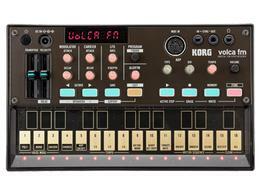 The Korg Volca FM is a DX7 emulation built with modern twenty-first century technology. About the size of a paperback book, it does much of what its ancestor could accomplish, with few of its drawbacks. It’s light, unlikely to stress anyone’s credit card, and being more of a sound module than a complete instrument, it can be availed of whatever MIDI keyboard is available to plug into it. Perhaps more to the point, the Volca FM will accept any of the countless thousands of extant DX7 voice banks and play them way better than they originally sounded. Connected to a modern digital keyboard – we used a Yamaha P155 digital piano – the Volca FM offers the almost limitless palette of sounds of the original DX7, with few of its issues. It doesn’t even take up much space. The Volca FM boots up with an initial bank of 32 genuinely interesting FM voices. In fairness, they’re not the voices I’d have chosen for the music I like to play, but this was of scant issue, as they’re readily changed. In fact, its capacity for supporting any voices its users want to hear – out of an almost limitless palette – is one of the Volca FM’s best tricks. Connect it to a keyboard and an amp, power it up and rock. If the installation were any less complicated, it would operate by thought control. The first thing that’s startling in hearing the Volca FM is how much better it sounds than an original DX7. While it’s equally capable of creating the textured, lush music of its ancestor, the Volca FM does so with flawless quality. It’s easy to forget that you’re listening to a synthesizer… unless you choose a really weird voice to play, of course. Changing the Volca FM’s voices involves selecting the one you want with a front-panel knob… admittedly, a very small one, as all the controls on this instrument are. Doing so will also introduce the first of the Volca FM’s quirkier aspects. Rather than a traditional synthesizer LCD display panel, the Volca FM communicates with the external universe using ten seven-segment digits, as will be apparent in the photograph at the beginning of this review. In answer to what might be an obvious question, it does manage to convey alphabetic characters through its display panel, if somewhat cryptically at times. You’ll be able to determine the names of the voices you select, although you might have to re-learn how to read English to do so. This is rarely much of an issue… it’s just a bit of sci-fi to include in the experience of playing this device. The Volca FM supports three-note polyphony, down considerably from the sixteen notes of the original DX7. This may be its most noteworthy shortcoming, although in practice, it doesn’t prove to be as much of a limitation as it seems. You can’t play jazz rhythm on a Volca FM, but it’s unlikely you’d want to. It lives for lead lines. You might want to consider the last time you played more than three-note chords on a synthesizer and had the result sound like anything other than a sack of cats or a roomful of liberals. The Volca FM doesn’t support the MIDI messages involved in managing a sustain pedal, which is a genuine drawback for some playing. It also ignores keyboard velocity, which I came to regret early on. One of the interesting enhancements the Volca FM offers to the original sound palette of the DX7 is the addition of an optional chorus effect. It can be switched in or out through the instrument’s user interface. The chorus fattens up the already textured sound of its FM synthesis engine and makes it sound decidedly more contemporary. FM traditionalists will no doubt cringe at the thought, but they’re free to disable it. The Volca FM also includes a fairly sophisticated phrase looper… which I almost completely ignored. While it does what it does pretty well, I’m more into playing music than programming it. It’s worth noting that the Volca FM includes a MIDI IN jack, to send it voices and keyboard messages. It lacks all vestiges of a MIDI OUT jack, which means any voices created through its user interface can’t be downloaded or preserved save in its own memory. While the Volca FM does include a tiny touch-sensitive keyboard built into its diminutive front panel, for practical purposes, you’d want to connect it to a full-size keyboard instrument. In fact, while it enjoys a fairly sophisticated user interface, most of its functionality is best handled externally. It’s in its element as a voice module. There are a number of other bits of reality involved in properly appreciating this device. The Volca FM has an internal speaker, which allows its sound to be heard with no other technology connected to it. This said, most voices played this way resemble enraged squirrels – it’s a very small speaker. Connected to a real amplifier with full-size speakers, the Volca FM can blow the roof off your digs. As it emerges from its packaging, the Volca FM wants to be powered by six AA batteries, thoughtfully included in the box. Once again, this works – ostensibly for about ten hours of playing – but it’s probably not how you’ll want to power it long term. It requires a suitable wall-wart power adapter, and because the power jack on the Volca FM is slightly non-standard, you’ll probably want to spring for Korg’s official and decidedly pricey KA350 power supply. The user interface of the original DX7 allowed for the modification and creation of its voices, and you can do the same thing with the buttons and sliders of the Volca FM. They’re even affixed with circa-1983 colors to further enhance its decidedly retro vibe. This said, creating or editing FM voices is a non-trivial task, and attempting to accomplish it though a few cryptic buttons and sliders is likely to propel even the sanest musician into an alternate universe populated by hyper-intelligent penguins. While the Volca FM will accept standard DX7 voice banks uploaded through its MIDI interface, it doesn’t include any software to actually do so. About twenty minutes after it arrived, we came to appreciate that the Volca FM would benefit immensely by a Windows-based voice manger, and as we had actually created one about a year earlier for a different synthesizer, it seemed that adding DX7 support would prove to be a natural extension of its capabilities. As such, being the mercenary capitalist swine that we are, we’d like to observe that our Voice Manager application is pretty much ideal for uploading voices to the Volca FM, for managing its banks of voices – especially if you’d like to assemble custom banks of individual voices to suit your playing – and for creating your own voices from scratch through its on-screen voice editor window. The Voice Manager voice editor is vastly easier to use than the internal voice editor of the Volca FM. In the process of developing the Voice Manager interface for our Volca FM, we Googled for downloadable DX7 voices. When the dust settled, we discovered that we’d amassed over 15,000 32-voice banks. We’ve only auditioned a fraction of them as of this writing, and it seems likely that some of them will prove to be duplicates, but the vast palette of sounds available for the Volca FM is seriously awesome. The Volca FM arguably isn’t a perfect new-millennium replacement for the original DX7 – its lack of full polyphony, sustain and velocity support; its truncated MIDI interface; its minimal MIDI message palette and its diminutive front panel all detract from its potential. This said, it gets pretty close. It’s unquestionably worth what it costs, and for most keyboard players who’d enjoy modest recourse to the sounds of the original DX7 without keeping one in a closet, it’s superb. There are a few other contemporary FM synthesizers available – most notably the Yamaha reface DX – but none of the ones of our experience were disposed to accessing the huge extant pool of original DX7 voice banks. The Volca FM is a lot of fun in a very small box, and availed of a suitable source of uploadable voice banks, it’s limitlessly versatile. If you can’t find the sound you want in it, your sound just doesn’t exist.